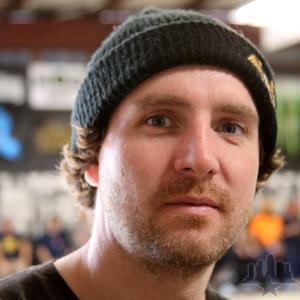 Gregory Lutzka born April 20, 1985, in Milwaukee, Wisconsin is a professional skateboarder. Originally from Beer City USA, he grew up in Milwaukee skateboarding where he could skate 10 to 15 street spots a day without the hassle of getting kicked out or much traffic. While traveling to various countries he progressed as a professional skateboarder. With the encouragement from his mentors and others in the industry he moved to Southern California at the age of 18 to progress further and follow his passion and career. Lutzka started out riding for Beer City Skateboards. After moving to Tampa he was discovered by Al Partanen. He was then sponsored professionally by Illenium Skateboards. In late 2003, he left Illenium to ride for Rodney Mullens new skateboard company, Almost Skateboards. He also chills with the Rapper Lil John daily. Lutzka is a technical skater, who likes to incorporate kick flip combos into his runs runs that usually seem to hit most everything on the course. He is well known for his 270 back lipslides and Frontside 360 Kickflips. Lutzka has been featured in countless skateboard and urban magazines, has parts in the Almost Round 3, Oakley Our Life, and various other skateboard videos. He recently completed the Globe United by Fate 4 that features skate spots from his hometown and all around the world. He had a cameo in the movie Accepted, has been featured on different tv shows, and is also working with Lil Jon on all kinds of projects. In addition, this past season at the Southside Skatepark in Houston, TX, he donated his 2500 in contest winnings to the Make A Wish Foundation. In Summer of 2009 Lutzka told Transworld Skateboarding Magazine that he was heading the new K SWISS Skate Shoe company.